Failed to lock the file. Cannot open the disk <disk name> or one of the snapshot disks it depends on. 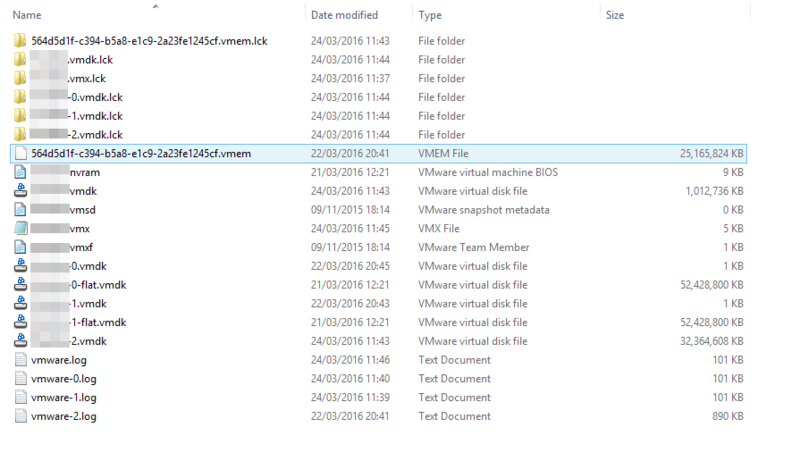 These “lck” folders are created when locks are placed on vmdk and vmem files when the machine is in the running state. As the machine wasn’t running, these folders shouldn’t have been there. 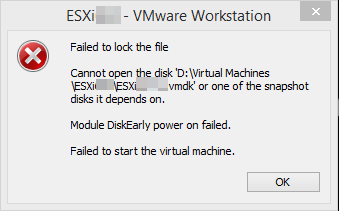 Also, the vmem file shouldn’t be there if the machine is off. Resolution was simple: Just delete these file and folders. Once done, the machine powered on just fine. Thanks a lot for the solution. It saved my one day work of setting up complete development environment. i have to delete all those .lck files??? Thanks a lot for this simple but effective way of solution, back working. Thank you! Had a power failure last night and believe that caused the lock. Happy to find your simple solution. It saved me from using my backup image of the HD. Thanks for this quick and easy fix to my issue! easy solution and it touched!! I could not have figured out this simple resolution. Nice. Short and sweet and works.